Consulting detective Sherlock Holmes has been fascinating generations of readers, watchers and listeners for over 130 years, since he first appeared in print in 1887. Now an internationally renowned cultural icon, his name appears on books, films, television dramas, radio plays, stage adaptations and the rest right across the world and he is listed in the Guinness Book of World Records as `the most portrayed movie character' in history. 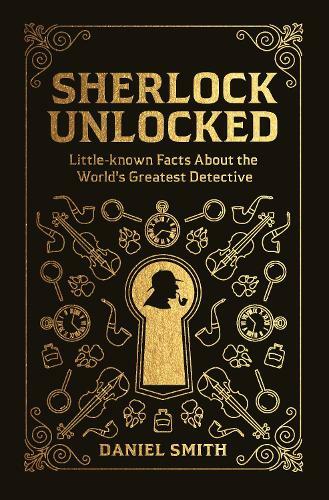 With all this material readily available, one might think there's not much to find out about Sherlock, but in Sherlock Unlocked, Daniel Smith looks behind what we think we know about the well-known sleuth and reveals little-known facts of which every Sherlock aficionado should be aware. From the eccentric and odd characters to the bizarre plot twists, and from Conan Doyle to Moriarty, this book will appeal to Holmes' fans old and new. - The shameful addiction of Watson's that Holmes kept secret - a dark gambling habit. - The part the legendary Langham Hotel played, in both Conan Doyle's literary friendships - including with Oscar Wilde - and in the storylines he created for Holmes and Watson. - Holmes's retirement passion was bee-keeping. - One of Conan Doyle's childhood teachers, Eugene Chantrelle, became a notorious murderer.